7 When they have finished their witnessing, the wild beast that ascends out of the abyss will wage war with them and conquer them and kill them. 8 And their corpses will be on the main street of the great city that is in a spiritual sense called Sodom and Egypt, where their Lord was also executed on the stake. 9 And those of the peoples and tribes and tongues* and nations will look at their corpses for three and a half days, and they do not allow their corpses to be laid in a tomb. 10 And those dwelling on the earth rejoice over them and celebrate, and they will send gifts to one another, because these two prophets tormented those dwelling on the earth. 11 After the three and a half days, spirit of life from God entered into them, and they stood on their feet, and great fear fell upon those who saw them. Portentous emphasis is placed on 1919, this being the year that Jesus is said to have chosen Watchtower and its Governing Body to represent him on earth. Yet, the minimal Scriptural backing Watchtower uses to support this year is both flimsy and illogical. 1919 is described as a time of spiritual deliverance, the year the Watchtower Governing Body were appointed as the faithful slave. Is there Scriptural support that the year 1919 holds prophetic significance? The basis to arrive at 1919 relies almost entirely on Revelation chapter 11. Revelation 11 describes "two witnesses," a period of 1260 days, a period of 3 1/2 days, and finally great fear for the nations. The "two witnesses" are supposed to parallel with the Faithful and Discreet Slave. Revelation 11 is the first mention of the two witnesses, and Watchtower matter of factly claims they parallel the faithful slave of Matthew. There is no reason for such a link, other than wishful thinking. Watchtower uses 1914 as the starting point for the 1260 days, the year Jesus is said to have commenced ruling in heaven. 1914 is not Scripturally supported as the start of Jesus heavenly reign, a topic in its own right. Jesus rulership was said to have commenced in October 1914, but the 42 months/1260 days are said to have started in December. There was no explanation for the two month difference. This is simply overlooked, as Watchtower attempts to align a period of history that does not fit. 1260 days, 3 1/2 years or 42 months are all based on a 360 day lunar calendar, yet Watchtower applies it to a solar calendar. The release of the Watchtower directors from prison in 1919 is supposed to correspond with Jesus appointing the Watchtower Governing Body as his slave. There is no reason to think the release from prison of the Watchtower directors should indicate that Jesus had chosen them as his Faithful Slave. When they left prison, they continued preaching exactly the same doctrine as before prison, including the same falsehoods, such as that the end would arrive in 1925. Does anyone really believe that what happened to Jehovah's Witnesses in 1922, a period no one is alive to remember, is fulfilment of Revelation prophecy? Not a single step in the process above that is used to arrive at 1919 is at all compelling, most of the reasoning is in fact illogical or of no basis. The following table is taken from the Ministerial Training School notes conducted during the mid 2000's. In 2013, this teaching was simplified by removing 1918 from the equation. The article explains that since Jesus cleansed the temple twice, it shows an ongoing cleansing work between 1914 and 1919. However, this does nothing to clarify why 1919 has any Scriptural relevance, as no backing is given to support how long the cleansing would be for. Watchtower 2014 Nov 15 conjoins the 1260 days with the 3 1/2 days to arrive at 1919. 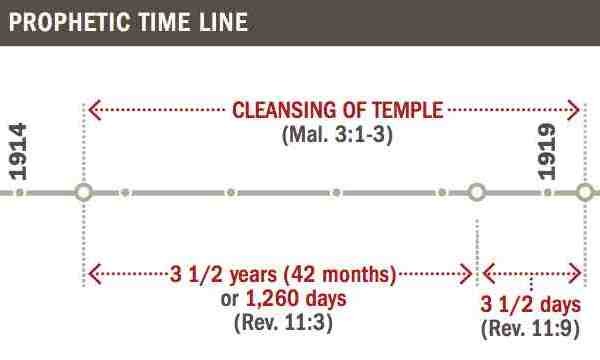 This becomes nonsense, as the Watchtower presents the 1260 days as literal, but the 3 1/2 days as symbolic, yet adds them together to support the period of time from 1914 to 1919. The timeline graphically highlights the discrepancy by a multiple of 75 in the time frame of the figurative 3 1/2 days and literal 1,260 days. The timeline does not provides a specific start and end date for the 1260 days, because they do not align with any specific occurrence, as detailed at 1260 days. 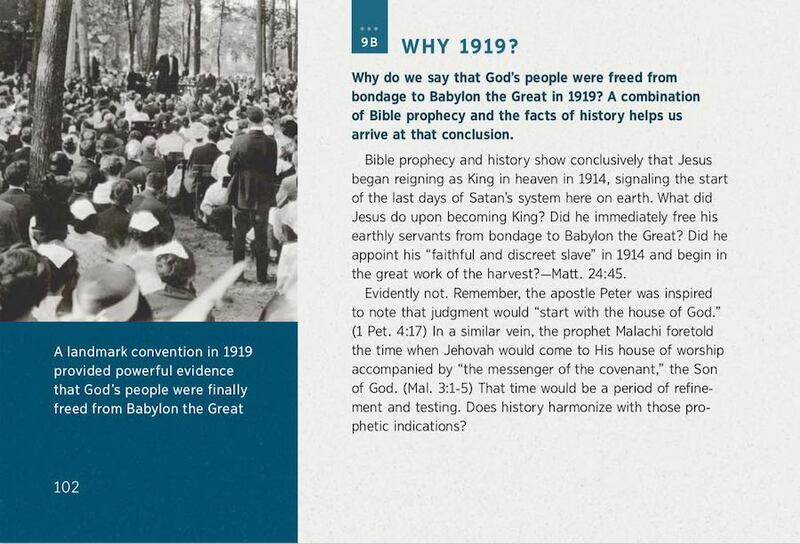 Watchtower has greatly simplified its publications in the twenty-first century, and the effort it makes to justify 1919 is a case in point. The 2018 publication Pure Worship of Jehovah - Restored at Last! devotes a section to providing "evidence" that "God's people" were chosen in 1919. The book Pure Worship claims there is Biblical and Historical evidence behind the 1919 doctrine, yet no effort is made to present any Biblical reasoning for the year 1919, and the historical evidence is quaint at most. Watchtower's other line of reasoning to support 1919 is historical, with the claim that it proved itself to have been chosen by Jesus as the only "clean" organization representing him. Watchtower teaches the group went into Babylonish captivity between 1914 and 1918. This culminated with the directors of The Watch Tower Society being sent to prison. In 1919, Jehovah released them. The reason Jehovah supported the Watchtower leaders, as "proven" by their released, is because they were cleansed, wholly theocratic, and providing spiritual food. There is absolutely no basis to any of these statements. There is no evidence of a selection by Jesus and no cleansing of doctrine. They still used the cross, celebrated birthdays and Christmas, and followed a body of doctrine vastly different to today. By current standards, in 1919 Watchtower was very much an apostate organization. Watchtower points to three highlights during this period - the release of the book The Finished Mystery in 1917, the lecture Millions Now Living Will Never Die in 1918 and subsequent brochure, and the periodic journal The Golden Age in 1919. All three of these publications are shocking for a Jehovah’s Witnesses to read today. The Finished Mystery needs to be read to be believed, as it is the low point in Watchtower publications, with the doctrine it promoted now rejected almost in entirety. Second hand copies can still be found for sale online, or scanned versions can be downloaded from archive.org/details/TheFinishedMystery. The title page claims it to be "The posthumous work of Pastor Russell," though it was written by Woodworth and Fisher and authorized for publication by Rutherford. Teachings from this book include that the last days started in 1799, Jesus second coming was 1874, and that in 1918 the churches would fall and the anointed raised to heaven. It was said that Jesus is the Alpha and Omega, whilst the rider of the white horse is the Pope. The glory of the angel of Revelation 18:1 refers to modern discoveries such as correspondence schools, celluloid, Divine Plan of the Ages, talking machines, vacuum cleaners, induction motors, pasteurization, Panama Canal, shoe sewing machines, subways, skyscrapers, Roentgen rays and Leviathan is the locomotive. The size of the Great pyramid confirms the harvest had begun, and the distance from the place where The Finished Mystery was produced in Scranton to its shipping destination New York City was predicted by Revelation 14:20. The main focus of Millions Now Living Will Never Die was presentation of the teaching that the end would arrive in 1925, with Abraham being resurrected onto earth in that year. This is discussed in detail at 1925 - Millions Now Living Will Never Die. The Golden Age, of which Woodworth was editor, was filled with an incredible amount of inaccurate pop science and childish doctrine, some of which is quoted at Medical Advice. None of these journals presented cleansed spiritual food, but rather fanciful doctrine and lies that are dismissed by the 21st century Governing Body. Whilst Watchtower spins the jailing of Rutherford and his associates as "Babylonish" captivity, the reason they were jailed was for sedition. The Finished Mystery vilified other religions and encouraged sedition against the United States government. The Finished Mystery quote above was page 251 of the 1917 edition. Rather than stand fast to its beliefs and principles, Watchtower meekly followed the United States governmental ordered to remove pages 247 to 254 from The Finished Mystery. In the 1918 edition, the section covering the sub-heading “Out of the mouth of the dragon” was reduced from 5 pages to 1 paragraph. Click here for a PDF scan of the pages from the 1917 edition that were removed from the 1918 edition. Watchtower was not imprisoned for preaching truth about God’s Kingdom; it was for taking side in politics. Their release was equally a violation of their principles, a result of complying with the government order to change what they had printed. Neither action showed them to be spiritually cleansed. Many Watchtower followers left during this the period after 1914, recognising Watchtower as a false prophet, falsely teaching that the New System would arrive in 1914. Prominent members removed themselves from the organisation as well, taking offence at the leadership of Rutherford. After the death of Russell, Rutherford took control of The Watch Tower Society. In his will, Russell had outlined a list of 5 recommended names for the Editorial Committee. 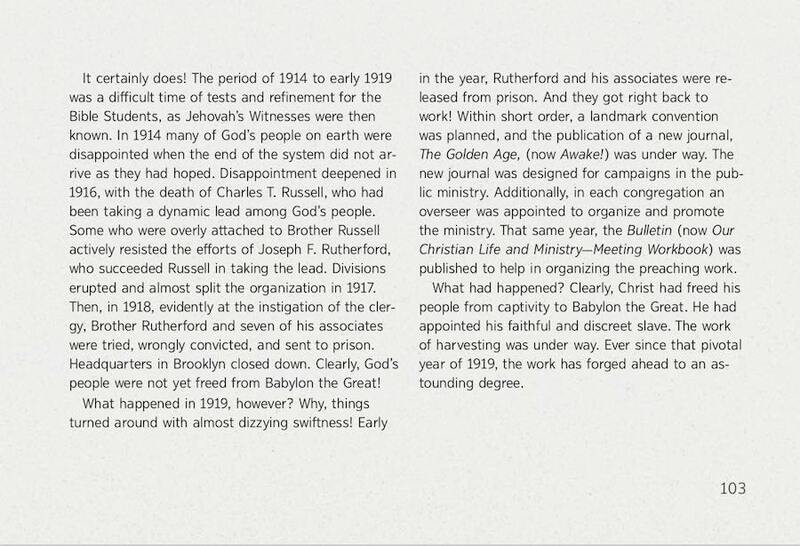 ("Will and Testament of Charles Taze Russell" Watchtower 1915 Dec 1 reprints p.5999) Despite not being on this preferred list, Rutherford took leadership, and enforced this through a legal battle against the other directors. 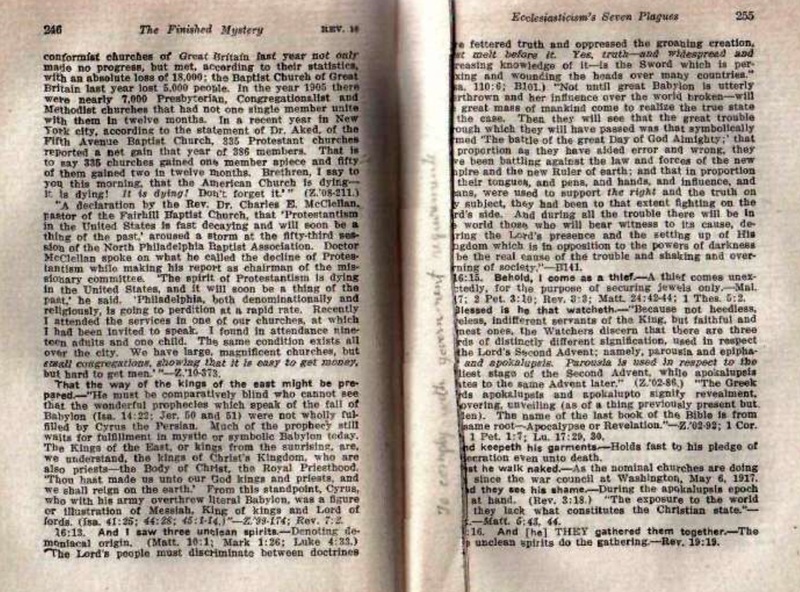 Rutherford went on to commission the printing of The Finished Mystery without obtaining the permission of the directors, as required by the Watchtower charter. Watchtower has used the term evil slave to vilify those followers that could not in good conscience align themselves with an organisation that have proven itself to be a false prophet, and attack the directors that could not align themselves with its new leader that aggressively took control and introduced new doctrine that were far fetched, law breaking, and are even more embarrassing to read today. The period 1914 to 1919 is the low point of their history, yet now described as the time that Jesus chose them to lead his organisation. 1914 had proven to be false prophecy, with not a single prediction for that year taking place. In 1916, the founder, Pastor Russell, died and Rutherford took leadership in a hostile takeover embroiled in legal battles. From there he launched a platform to dramatically change the religion over the next two decades. It should be a matter of grave concern for each of Jehovah's Witnesses that the underlying doctrine for 1919, the year so key to their leadership's authoritarian claims, rests on such baseless Scriptural and historical manipulation. The most comprehensive book outlining the early history of Watchtower is Apocalypse Delayed-The Story of Jehovah's Witnesses, by Professor M. James Penton. Written 2013. Latest update October 2018.